We have finally arrived upon the first weekend of college football, and I for one could not be more excited. My focus is always on the Southeastern Conference. It is very hard to predict this year outside of Alabama, but I will give my best shot. Alabama lost a lot of talent to the NFL this year particularly on defense, but the Tide return one of the most talented offenses in the country led by sophomore quarterback Jalen Hurts. For all the criticism of Hurts in the offseason, he did win SEC Offensive Player of the Year last year as a freshman. If Hurts improves as a passer, Alabama will be that much more deadly. His job will be made easier by the return of a talented receiving corps led by Calvin Ridley and a star-studded running back group led by Bo Scarborough. The defense lost a lot of talent in the offseason but should be just fine as Minkah Fitzpatrick, Rashaan Evans and Da’Ron Payne look to pick up the slack on this stop unit. Saban’s team again runs the table, wins the SEC Championship and gets to the playoff again this year. The Auburn Tigers are poised to have a very good season as Jarrett Stidham seems like he will be the missing piece at quarterback to get head coach Gus Malzahn’s offense going on all cylinders. Auburn has enough talent (including the SEC’s leading rusher from 2016 in Kamyrn Pettway, a deep receiving corps and a solid defense) around Stidham to seriously contend for the West this year. They will stumble late yet again against rivals Georgia and Alabama to come up just short of going to Atlanta. Ed Orgeron is embarking on his first season as the permanent head coach of LSU and hired Matt Canada as offensive coordinator in the offseason to help shore up that side of the football. Canada will have at his disposal an offense led by superstar running back Derrius Guice, who has a chance to contend for the Heisman this season in my mind, but other than that has a lot of question marks. The biggest question mark is how will senior quarterback Danny Etling fair? Will he continue to be just okay or will he take a step forward in the new offense? LSU will be good in 2017, but mediocre quarterback play and a rebuilding (yet still talented) defense will keep them from being great this year. Watch out for them in the future though. Head coach Kevin Sumlin has to do well this season, or he will be gone. That is all there is to it. The Aggies always seem to do incredible in the first half of the season but stumble down the stretch. This year will tell a similar tale despite having star power in running back Trayveon Williams, dynamic wide receiver Christian Kirk and others. Will 8-4 be enough to calm down the athletic department and make them keep Sumlin? Doubt it. Texas A&M (by today’s standards) can do better. Bret Bielema was the talk of college football when Arkansas hired him away from Wisconsin in 2013. However, Bielema has not lived up to the hype at Arkansas, as he has gone 25-26 overall in Fayetteville and has yet to put together a complete team. The Razorbacks had a disappointing 2016 that ended with a loss to Missouri and a bowl game loss to Virginia Tech, despite being up by 24 points. Safe to say, there is some grumbling about Bielema. That will not change this year, but hey, at least the offense, led by Austin Allen, will score some points. Nick Fitzgerald is one of the best quarterbacks in the conference. Unfortunately, the guys around him (overall) are just not talented enough for State to contend in the West. Combine that with a tough schedule that includes an East crossover game against Georgia in Athens, and Mississippi State’s record will not show how good they are. They will still sneak up on some teams though. It is safe to say Ole Miss has had a tough offseason. Things are not going to get any better anytime soon with their fall NCAA hearing looming. Hugh Freeze is obviously gone too, and Matt Luke will head coach his first game as an interim. This Ole Miss team just does not have enough talent (outside of Shea Patterson and a good receiving corps) to improve on their 5-7 record from 2016. Choosing the winner of the East this year was very difficult. I got Florida winning the division based on the fact that you know what you are going to get with the Gators. Georgia is the popular pick to win the East, but they have a lot of question marks. (Rule of thumb: Never pick Georgia to win the East until they do it, and never pick Alabama to not win the West until it happens.) The East will come down to the annual meeting in Jacksonville, and the Gators will come out on top for the fourth straight time. Jim McElwain has done a good job in his two seasons in Gainesville, but his teams have struggled on offense, which is supposed to be his forte. The Gators lost a lot on defense, but they still have a lot of young talent and will not take a major step back. The offensive line is solid and the receiving corp is underrated led by Antonio Callaway (if he stays out of trouble after his one-game suspension). If McElwain can get solid quarterback play this season (Cc: Feleipe Franks), the Gators are going to be really good. Georgia is the most talented team on paper in the East, but will they take that next step and win it? Not this year. The Bulldogs have some serious questions surrounding the offensive line, a talented defense that has a history of underperforming, a shaky kicking game and more. However, if the Bulldogs answer some of those questions (mainly at offensive line) they could have a fine season. They definitely have the most upside of any team in the East. Their offense is looking for some serious improvement as they return Jacob Eason at quarterback and a stacked running back corps led by Nick Chubb and Sony Michel. The defense has the potential to be one of the best in the conference. Will it happen though? Smart has been killing it on the recruiting trail even if his team did not fare well on the field in 2016. The Bulldogs will have a bounce back year this season and come just short of winning the East. Look out for this team in 2018. They could potentially reach the playoff. This season will be pretty much the opposite of Will Muschamp teams so far. The South Carolina offense should be fun to watch and score a lot of points this year, but their defense will be the weak link. The Gamecocks just do not have enough talent on that side of the ball. That is why I see South Carolina having an up-and-down year. Watch out for this team in the future when Muschamp gets his players though. Impact Players: WR Jauan Jennings, TE Ethan Wolf, DB Todd Kelly Jr. The Volunteers lost a lot of talent in the offseason, and it appears their window to win the East has closed for a while. That will certainly be the case this season. Derek Mason has quietly done a solid job in Nashville. The Commodores returned to a bowl game last year for the first time since 2013. Star running back Ralph Webb and several other key players return and give Vanderbilt confidence that they are bound for a big year. However, their overall record will not really convey how good this team is as their schedule is very difficult. They will make the postseason once again in 2017 though. I am higher than a lot of people on Missouri this year. They were better than there 4-8 record showed last year. The offense, led by junior quarterback Drew Lock, star wideout J’Mon Moore, who led the conference in receiving yards per game last year and sophomore running back Damarea Crockett, who is the most underrated back in the SEC in my mind, etc, is extremely talented and will score a bunch of points this season. Can the defense stop anyone in 2017? That is the question 2nd-year head coach Barry Odom will have to answer after his defense struggled mightily in 2016. Ultimately, I see Missouri getting through a tough schedule and getting to a bowl game. Impact Players: QB Stephen Johnson, LB Jordan Jones, RB Benny Snell Jr. Safe to say, I am not as high as a lot of people on Kentucky this year. While they have a pretty good team this year, I believe they will regress this season. The difference between not getting to the postseason and getting to a bowl is their season finale against Lamar Jackson and Louisville. Louisville is not going to lose this year. I love Johnny Manziel. Let us just get that out of the way. He was easily one of my favorite college football players to watch ever. The guy had the “It” factor; that was for sure. Known for being a electrifying yet controversial player both on and off the field, Manziel found himself back in the news recently. Manziel sat down with Clay Travis of the madly popular Outkick The Coverage at the International Football Betting Conference in Costa Rica in early August. He was asked about his plans if his NFL comeback did not work out. For me personally, this was fantastic news. More Johnny Football after football? Sign me up. I have to say though. I hope that Manziel ends up coaching the SEC one day so badly. Everyone knows the SEC is the already batsh*t crazy anyway. Could you imagine a world in which Johnny Manziel is coaching in the SEC? Just imagine it for a second. He would be Lane Kiffin on steroids. The SEC (as a whole) has the best traditions and pageantry, overall talent and prestige of any conference in the country. They have also had a history of not only great but colorful coaches, although most of the current coaches in the SEC are garbage and that is a direct reflection on the conference’s recent backslide. Add Johnny Manziel to that list of SEC coaches, and it would undoubtably be insane. I mean Manziel is basically just your average frat guy that happens to be pretty damn good at football. That is the truth. I guarantee we would see pictures of Manziel at college parties while he is coaching. (Maybe, he will even bring back the Scooby Doo costume.) No doubt about it. Manziel is a legend and for good reason. The dude could play, and his college career showed it. The Texas native burst onto to the scene in 2012, when as a redshirt freshman, he was absolutely electrifying and led Texas A&M to an 11-2 record (in their first year in the SEC) including huge wins against then No. 1 and eventual national champion Alabama on the road and a blowout victory against Oklahoma in the Cotton Bowl. For his efforts that year, Manziel won the ultimate award in college football – the Heisman Trophy. His games were all must-see television events as it seemed he would always do something remarkable and unthinkable on any given Saturday. His next season in 2013 (which also happened to be his last) was arguably better than his Heisman-winning season. I will never forget attending his last collegiate game. It was the 2013 Chick-Fil-A Bowl in Atlanta versus Duke. Texas A&M were down 38-17 to the Blue Devils at halftime and came back to win 52-48 thanks to Manziel’s amazing passing performance (30-of-38 for 382 yards and four touchdowns). Manziel had a truly unbelievable collegiate career, and who knows if he can make a comeback to the NFL. Frankly, I do not really care. I just want to see him as a head coach especially in the SEC. Do I think he will be successful? I do not know, but it will be an entertaining ride for sure. So that is why I hope and pray everyday that “Coach” Manziel will somehow end up in the wildest conference in college football – the SEC. One of the latest big topics around college football is the future of the Big 12 conference. The conference has experienced many problems from being the only Power Five conference to have only one team make an appearance in the College Football Playoff’s three year existence and experiencing financial issues and more. Whether Texas or Oklahoma remains in the Big 12 in the future remains a mystery as well. That is the biggest worry among Big 12 followers. People love to speculate about college football conference expansion, particularly in the offseason. One of those teams that might make a bolt in the future from the its current conference of the Big 12 is the aforementioned University of Oklahoma. There has been speculation in the past of Oklahoma landing in the Southeastern Conference eventually. However, someone who is very familiar with the situation in Berry Tramel of the Oklahoman appeared on the SEC Network’s Paul Finebaum Show on Wednesday and said that Oklahoma is ready for the SEC.
.@BerryTramel says OU fans are done with the Big 12. "They are ready for the SEC & it's fairly overwhelming. It's wide support for the SEC"
Honestly, this would be the most ideal situation for Oklahoma and certainly the best for the SEC as well for several reasons. First, Oklahoma just makes sense geographically. The state of Oklahoma borders three SEC states in Missouri, Arkansas and Texas. Second, Oklahoma just seems to be a great fit. They have a great fanbase with a nationwide following, great tradition and a great athletics program. The Sooners boast one of the winningest programs in college football and have seen consistent success under current head coach Bob Stoops, who won the national championship in Normon in 2000 and has also added ten Big 12 titles. Third, Oklahoma would certainly boost its recruiting, particularly in football as players want to play in the most storied and consistently talented conference over the past years. Oklahoma’s recruiting is already very good, but it could become even better if the Sooners head to the SEC. Fourth, although Oklahoma struggled this past season, they bring a strong basketball program to the table and success in other sports. However, if Oklahoma makes a conference change, in-state rival Oklahoma State’s status becomes an issue. Politics would certainly come into play, and that might force the SEC to take Oklahoma State as well. 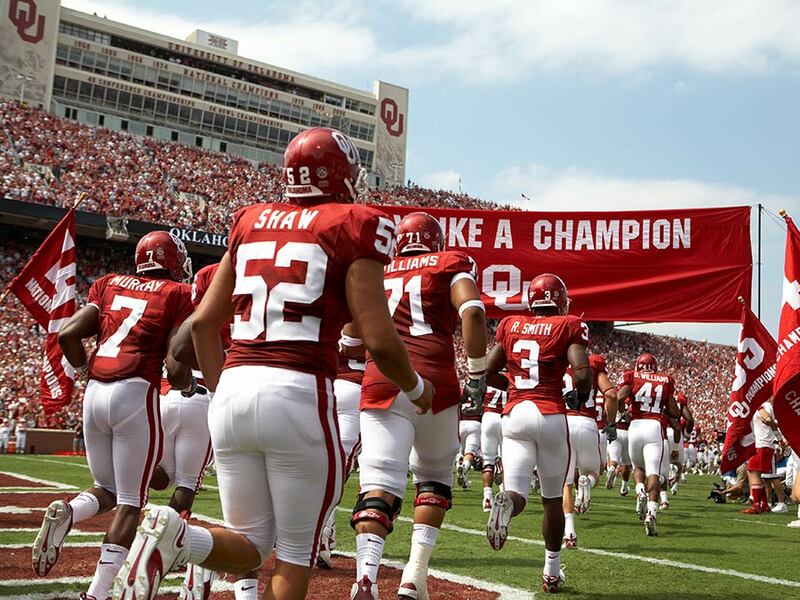 Is OU & OKST a package deal in realignment? If this is ultimately what happens, fans would likely see a transition of both Auburn and Alabama leaving the SEC West and heading to the East. However, if we use logic here, the SEC should just go ahead and move Missouri to the West. Does that mean one of the Mississippi schools (Mississippi State based on geography) would have to be moved to the East? Anyway, it is all speculation at this point, but it could definitely be a reality in the future. Maybe we will all hear Stoops say the SEC chant before it is all said and done. Let us hope Oklahoma to the SEC becomes a reality. It just makes sense. One down, eight to go! There are a ton of exciting and intriguing games going on in the SEC this weekend. We give you a birds-eye view of every matchup and predict the winner. Let’s start with today’s lone game – Arkansas versus Missouri. Preview: This game will be all about offense. Both teams average over thirty points a game. Arkansas’ Mr. Do-It-All a.k.a. running back Rawleigh Williams is sensational, and he leads a talented Hogs’ scoring attack. Missouri will miss breakout running back Damarea Crockett due to suspension, which will hurt, but Ish Witter can be a capable back and quarterback Drew Locke and the rest of the Tigers’ offense seems to be coming into its own. Both teams are going to put up some points, but Arkansas will pull away in the fourth quarter. Preview: Star quarterback Lamar Jackson and Louisville are reeling after getting dominated by Houston last week. However, I think Bobby Petrino gets his team settled down this week. Kentucky has been trending upward the later it got in the season; they’re finally going to a bowl under Mark Stoops! Louisville has just a lot more talent than Kentucky and the nation’s No. 1 offense should get it back together this week. I think Kentucky will challenge early, and the Cards might come out a bit slow after having their playoff dreams completely crushed last week. Lamar Jackson’s team will settle down though and pull away. By the way, Lamar Jackson will be ticked off this week. Not a good omen. Preview: Georgia has dominated this rivalry as of late, winning 13 out of the last 15 games in the rivalry known as “Clean, Old-Fashioned Hate.” However, Paul Johnson’s Georgia Tech Yellow Jackets have won the last meeting in Athens. Georgia will seek to change that Saturday. UGA first-year head coach Kirby Smart and his defense might have some trouble with Tech’s dangerous triple-option offense led by quarterback Justin Thomas, who has proven to be adept at throwing the ball as well as running it. This will be quarterback Jacob Eason’s final game of his freshman regular season and first in this rivalry. Georgia’s defense will do enough, Georgia’s running game will be effective, and Eason and Smart will get that first win in the rivalry this Saturday. It will be an entertaining affair though. Preview: Mississippi State will travel to Oxford for the Egg Bowl on Saturday to cap off a disappointing year. Ole Miss has struggled themselves and will seek to become bowl eligible win a win. The focus of this game will be on the two talented promising quarterbacks in MSU’s Nick Fitzgerald and Ole Miss rookie Shea Patterson. Both are dual threats, and both are dangerous. However, Ole Miss is the more talented side, and I think Hugh Freeze’s team comes out on top. Preview: One of the greatest rivalries in all of college football will resume on Saturday afternoon. Auburn will travel to Tuscaloosa to take on undefeated and CFB Playoff shoe-in Alabama in the Iron Bowl. Gus Malzahn has gone a long way to redeem himself this year, and his Auburn team has improved as the season has gone by. Unfortunately for Auburn, Alabama is unbelievable this year, and this is probably the best team Nick Saban has ever had in Tuscaloosa. That doesn’t bode well for Auburn this weekend. Sensational freshman quarterback Jalen Hurts and Alabama will roll over the Tigers despite Auburn’s talented defense. Preview: Clemson is ultra-talented but have not played to their potential much this year. They should be motivated for this rivalry game, but this South Carolina team led by coach Will Muschamp has momentum. You want bowl game projections? We got bowl game projections! I think the Gamecocks and their stingy defense along with freshman quarterback Jake Bentley will keep the Palmetto State’s rivalry close. The Tigers’ star quarterback Deshaun Watson will make enough plays for Clemson to get the victory in the end. Preview: Tennessee somehow found a way to not win the East this year. (Guess a “championship of life” will have to do.) Anyway, the Volunteers still have plenty to play for including a possible berth in the Sugar Bowl. However, Vanderbilt will play spoiler and upset Tennessee in Nashville. Yes, it is an unpopular pick, but I believe it is going to happen. Josh Dobbs and the Volunteers will be limited enough by the stingy Vandy defense, and Commodores’ running back Ralph Webb will have a huge day against a susceptible UT run defense on the ground. Preview: It’s a night game. It’s in Tallahassee. But I’ve got Florida coming out with the victory. The Florida defense is nasty and will once again carry the team on their shoulders and defeat the in-state rival Florida State Seminoles for the first time since 2012. This will be a low-scoring affair, and that’s just the way the Gators like it. A strong running game and a stifling defense will be the difference for Florida. Happy Thanksgiving! This is always one of the most enjoyable weeks of the year for me personally and for many people. Besides the holiday, there are some big games in college football this weekend particularly in the Southeastern Conference. Tomorrow we will look at the top games of the weekend. Today we look at tonight’s matchup between LSU and Texas A&M. Let’s dig in right away. Preview: This year’s edition of LSU-Texas A&M has a lot at stake for both teams even though Alabama has already clinched the division. For LSU, this will probably be (game-time decision) superstar running back Leonard Fournette’s last regular season game. Couple that with Ed Orgeron needing this victory badly if he hopes to even possibly stay in contention for the permanent LSU head coaching job, and you see why it is so important for the Tigers. For Texas A&M, they can put an exclamation point on an up-and-down season with a win over LSU for the first time since the mid-’90s. Also, coach Kevin Sumlin’s team (with a win) can make their case for a Sugar Bowl bid depending on how the other games across the conference shake out. Everyone knows how good LSU is on defense. They currently are No. 11 in the country in total defense, and the unit should be a big factor in this game despite the loss to injury of leading tackler Kendell Beckwith. Moving to the opposing sideline, the A&M defense is giving up well over a hundred yards more per game than LSU. Although inconsistent, the Aggies’ defense does have talent (see defensive end Myles Garrett), and I think defensive coordinator John Chavis will have this unit ready to play in this game. On offense, Texas A&M has the slight edge in this matchup. Talented dual-threat quarterback Trevor Knight will be back for this game, and that is huge in this game. He is a difference maker, plain and simple. Knight will have a slew of weapons at his disposal including a receiving corps led by stars Josh Reynolds and the speedy Christian Kirk (also a dangerous kick return man) and a breakout freshman running back Trayveon Williams, who has rushed for 956 yards and seven touchdowns so far this season. LSU’s offense is not shabby either though not prolific. They are led by a top rushing attack. Even if Fournette is unavailable for this game, Derrius Guice has proven to be a capable back this season. This game is going to be an entertaining one, but I think Texas A&M finally gets the psychological weight off its shoulders and finally beats LSU thanks to Trevor Knight having himself a game. However, LSU will keep it close.